One possible cause for an audible “gulp” coming from the reader of a specifications sheet is coming across a requirement to comply, vaguely, with the REACH Regulation (EC) 1907/2006. Broadly, REACH is meant to ensure that products in Europe do not contain dangerous substances. The law is mainly focused at the manufacturers of large amounts of chemicals, but if you are a manufacturer who has been presented with this requirement, here is a crash course about three highly important items to get started. This blog article will focus on those items and is not complete (the law is over 500 pages, including the amendments). Article 6 (1) is stating that if you make a ‘substance’ and send it to Europe in quantities over one ton then they must be registered with the EU, following the REACH requirements. 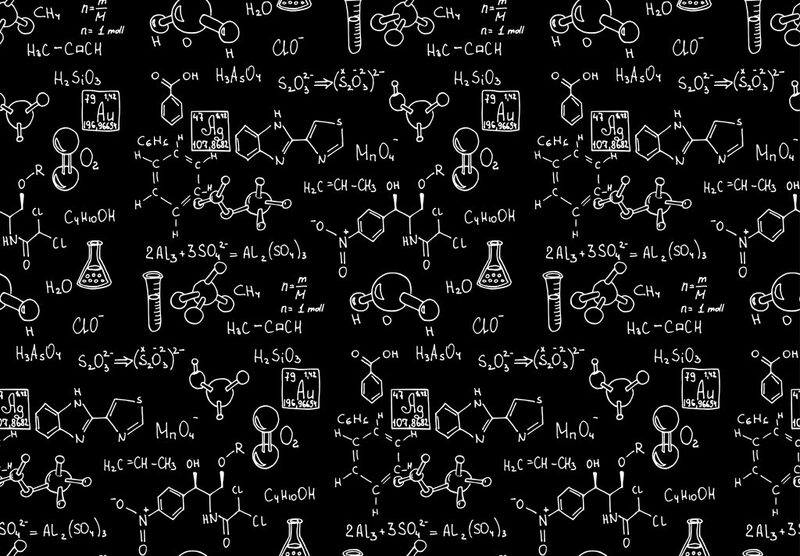 The substance can be by itself (picture barrels of chemicals) or in an article. An ‘article’ is what you make, and makes up what you make. In other words: a screw holding something together in your product is an article. The ‘substances’ referred to are the substances called out in the REACH Regulation. However, as pertains Article 6(1) and all of REACH: the responsibility to comply is with the entity in the EU. US manufacturers have no legal responsibilities under REACH. 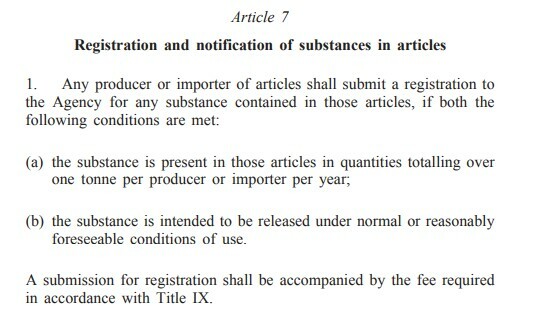 Considering the guidance presented above regarding Article 6(1), we understand this to mean that your customers in the EU are responsible to submit a registration to the Agency if the products (articles) they buy from you contains substances that are restricted by REACH are either in quantities over one ton or expected to be released in the environment. The ‘Agency’ referred to is the European Chemicals Agency. The requirements must be handled in Europe by the importer, but a US manufacturer should assist them in complying with the law by determining if chemicals listed in REACH are inside the product. The third item is Annex XVII – Restrictions on the manufacture, placing on the market and use of certain dangerous substances, mixtures and articles. Annex XVII lists substances that you cannot send in to Europe or can only send in after adhering to specific criteria. This brings me to the reason I decided to write this article, today. I received the weekly RAPEX report from the EU this morning. This product contains 0.0676% in the plastic part of the lure, presumably that means the octopus eyeballs. The importer was forced to remove these items from the market and to warn customers of the risk. These same restrictions apply to any equipment, it does not have to be a consumer good like a fishing lure. Manufacturers who build parts of machines or incomplete machinery (for example: no controls) must be aware that their equipment must not carry a CE marking and must follow a separate compliance path in the Machinery Directive 2006/42/EC. 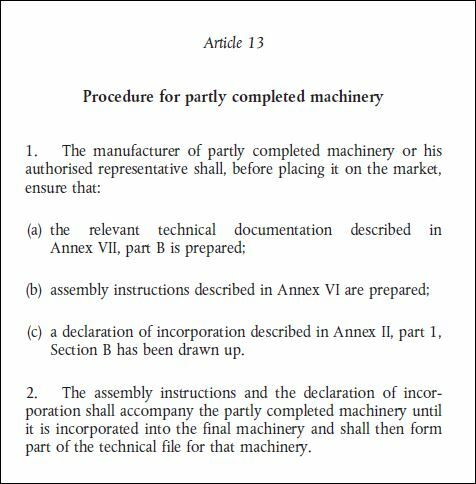 This is an important distinction because, in my opinion, it is more complicated (more documentation) to send a partly completed machine versus a fully functioning “machine” to the EU as pertains the MD 2006/42/EC compliance process. A CE marking is not allowed on the equipment until the integrator finishes the machine and makes it fully compliant. A declaration of incorporation instead of a declaration of conformity must be prepared. The most notable difference besides the title is that on a DoI the manufacturer must list every individual Annex I EHSR that is complied with. That is not done on a DoC. Are you bidding on or building a machine or partly completed machinery for the EU? Want some help? F2 Labs helps manufacturers across the globe every day with these issues. We have experts who quickly determine what is applicable to the equipment, legally and technically. F2 Labs is able to send a CE marking expert to your facility to provide overview training to your business – sales and engineering. We can quickly dig into the Directives that apply to your specific products and show your team exactly what is required and what your responsibilities are. Our approach is to show you the laws that you need to consider and real-world strategies for compliance. None of this is overly complicated but it can be intimidating at first. We will get you there. The RoHS Directive 2011/65/EU was amended in November 2017 by Directive (EU) 2017/2102 with some administrative clarifications. (2) Secondary market operations for EEE, which involve repair, replacement of spare parts, refurbishment and reuse, and retrofitting, should be facilitated to promote a circular economy in the Union. A high level of protection of human health and the environment should be ensured, including through the environmentally sound recovery and disposal of waste EEE. Any unnecessary administrative burden on market operators should be avoided. Directive 2011/65/EU allows EEE that fell outside the scope of the previous Directive 2002/95/EC of the European Parliament and of the Council (4), but which would not comply with Directive 2011/65/EU, to continue to be made available on the market until 22 July 2019. 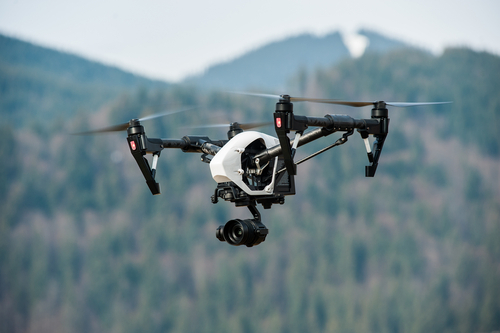 After that date, however, both the first placing on the market and secondary market operations of non-compliant EEE are prohibited. Such prohibition of secondary market operations is inconsistent with the general principles underlying Union measures for the approximation of laws relating to products and should therefore be removed. I found it interesting because it shows the cooperative nature of many of the laws instituted in the EU. 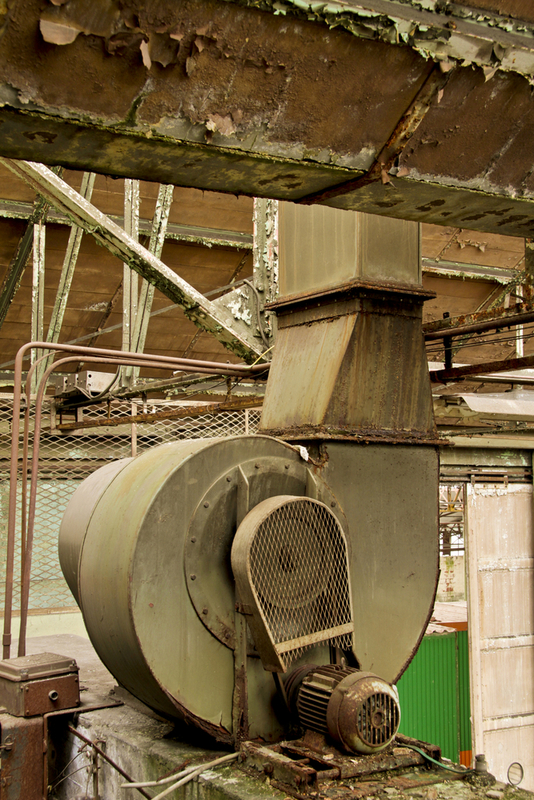 In summary – RoHS would have eventually required that “old” machinery be taken out of service because it was not compliant with the restriction levels. Since replacement parts would have to be sourced, probably from other retired machines, it would be impossible to bring in “RoHS compliant” replacement/spare parts for these machines. Meaning they would have to be retired. The EU recognized that this was contrary to one of the purposes of RoHS 2011/65/EU and the WEEE Directive 2012/19/EU: keeping electrical equipment out of landfills. Recital (2) allows machinery operators to continue to bring non-RoHS compliant spare parts in to the EU to keep legacy equipment operating… instead of forcing companies to dispose of the equipment. F2 Labs can evaluate your equipment for RoHS compliance and we can compile the required EN 50581:2012 report to prove that your equipment conforms, allowing you to refer to RoHS 2011/65/EU on the EU declaration of conformity for your equipment. F2 Labs assists many manufacturers, internationally, with CE marking requirements. Regarding CE marking, primarily we test and evaluate electro-mechanical equipment for compliance with electrical safety, machinery safety, EMC and radio, medical device, and hazardous location requirements. However, when a manufacturer completes a compliance project for Europe and places a CE marking on the equipment, that CE marking is an overt claim of compliance with the RoHS Directive 2011/65/EU: intentional or not. This is because the CE marking on a product is a claim of compliance to any CE marking Directive that is applicable. 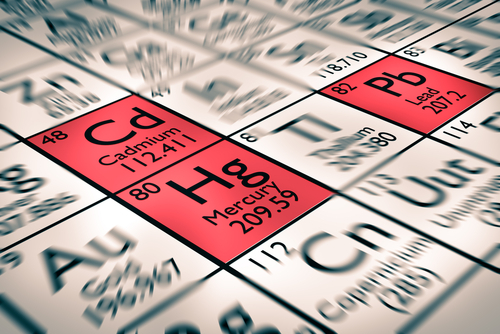 In other words: if your product is in the scope of RoHS then putting a CE marking on the product is a claim that it complies with the RoHS substance restrictions… for every component in and on your equipment. Including the paint and labels. It is very common for our customers to assume that RoHS does not apply to their equipment because it is machinery. This is not a legal reason to ignore RoHS. This article will explain why. This Directive shall, subject to paragraph 2, apply to EEE falling within the categories set out in Annex I. Next, we look to the WEEE Directive 2012/19/EU to see the indicative list of equipment matched to Annex I in RoHS 2011/65/EU. Keep in mind that these lists are indicative, not complete. And, we also highlight that WEEE and RoHS were written as complimentary Directives and refer to each other. (link: RoHS/WEEE). 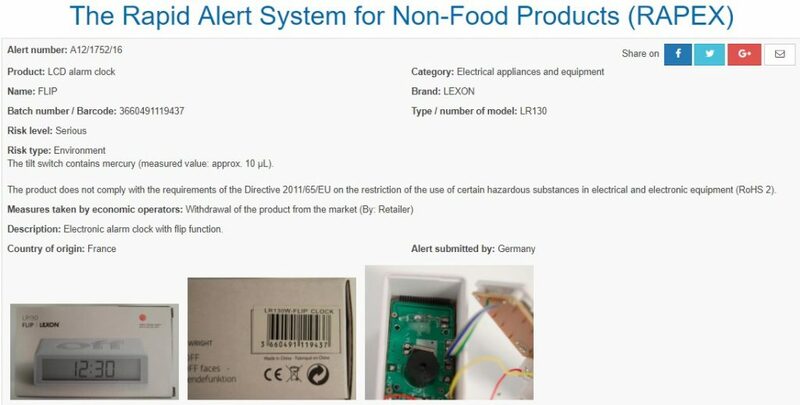 Next we refer to two possible exclusions in RoHS 2011/65/EU. 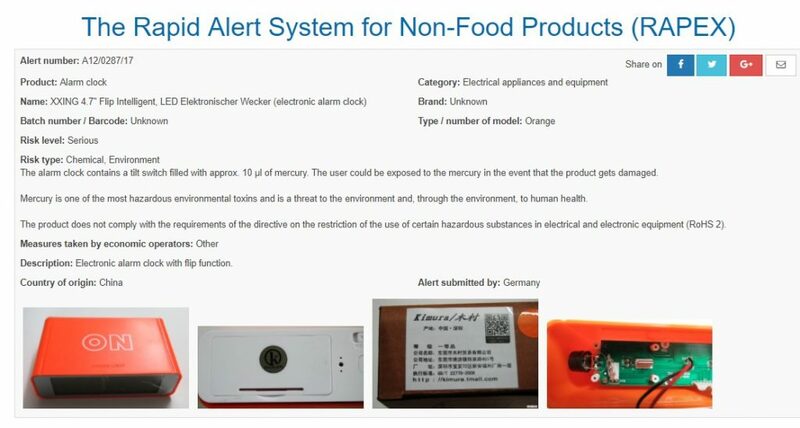 Referring next to the EU Commission published RoHS 2 FAQ, if you can not categorize your machinery as meeting ALL of the criteria below then your equipment is not excluded from RoHS. 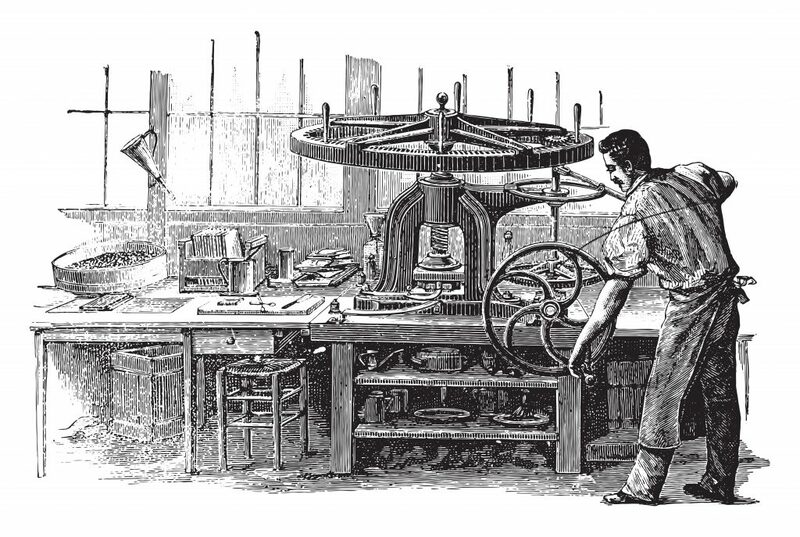 Q3.1 What are “large-scale stationary industrial tools” and “large-scale fixed installations”? (Articles 2(4)(d) and 2(4)(e)). Unlike RoHS 1, RoHS 2 has an open scope. However, several product groups are excluded from the RoHS 2 scope. Two of the exclusions listed in Article 2(4) refer to combinations of EEE in a professional context, i.e. “large-scale stationary industrial tools” (Article 2(4)(d)) and “large-scale fixed installations” (Article 2(4)(e)). Both terms are explained in the definitions (Articles 3(3) and 3(4)), however it is not explained what “large-scale” means. Both categories are combinations of various types of items, such as machinery, components etc. for permanent use at a specific place, installed and de-installed by professionals. Therefore the two categories may overlap. However, it is important to consider that the meaning of “large-scale” in absolute terms may be a different one for tools and installations, as there are differences between tools and installations. Tools are essentially machines, stand-alone or assemblies, often with moving parts, and used for example for the treatment or manufacturing of materials and work pieces. 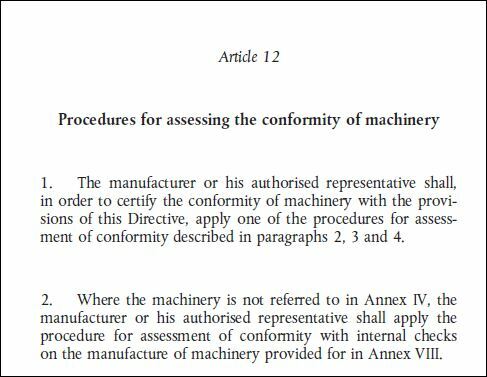 The Machinery Directive11 can be used as guidance. 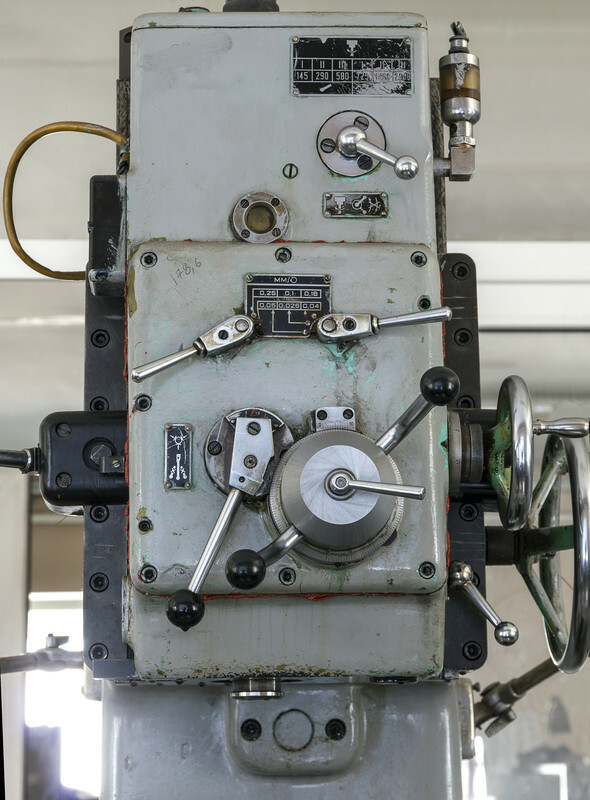 Typical machine tools can also be part of fixed installations. and it has to be large-scale. “Large-scale” is part of both sets of requirements. Evidently, this draws a line between “larger” tools and installations benefiting from an exclusion, and otherwise similar, “smaller” equipment. “Large-scale” refers to dimensional or similar criteria as explained below, although this criterion is not specified in the RoHS 2. The important take-away is this sentence from Q3.1: In order to benefit from either exclusion the tool or installation must meet all the respective requirements. 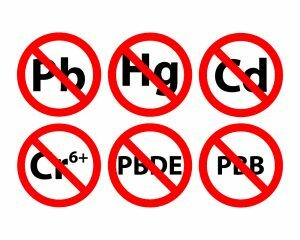 This means that your equipment must all of the above criteria in order to be excluded from RoHS. With that interpretation (provided by the EU) it is clear that most machinery is in the scope of RoHS, presently. complexity, and to the effort needed for installing, operating, maintaining and deinstalling a tool or an installation. larger than 5,71m x 2,35m x 2,39m, it can be considered large-scale. truck’s load capacity, it can be considered large-scale. installation can be considered large-scale. the environment needing structural modification, can be considered large-scale. The FCC released new guidance and procedures for manufacturers to show compliance with FCC regulations in June 2017. Some of the changes are in the labeling requirements and, notably, the allowance for the use of a Suppliers Declaration of Conformity, or SDOC. The National Institute of Standards and Technology published some basic information to understand this, here. It will be the responsibility of the manufacturer or importer to permanently affix the appropriate label when marketing the equipment. This device complies with part 15 of the FCC Rules for use with cable television service. (4) Where a device is constructed in two or more sections connected by wires and marketed together, the statement specified under paragraph (a) of this section is required to be affixed only to the main control unit. (5) When the device is so small or for such use that it is impracticable to label it with the statement specified under paragraph (a) of this section in a font that is four-point or larger, and the device does not have a display that can show electronic labeling, then the information required by this paragraph shall be placed in the user manual and must also either be placed on the device packaging or on a removable label attached to the device. Devices subject to authorization under Supplier’s Declaration of Conformity may be labeled with the following logo on a voluntary basis as a visual indication that the product complies with the applicable FCC requirements. The use of the logo on the device does not alleviate the requirement to provide the compliance information required by §2.1077. (3) The identification, by name, address and telephone number or Internet contact information, of the responsible party, as defined in §2.909. The responsible party for Supplier’s Declaration of Conformity must be located within the United States. FCC Manual Statement: §15.21 Information to user. The EU has a direct conduit for market surveillance authorities to communicate information about non-compliant products directly between 31 EU member nations and the European Commission. 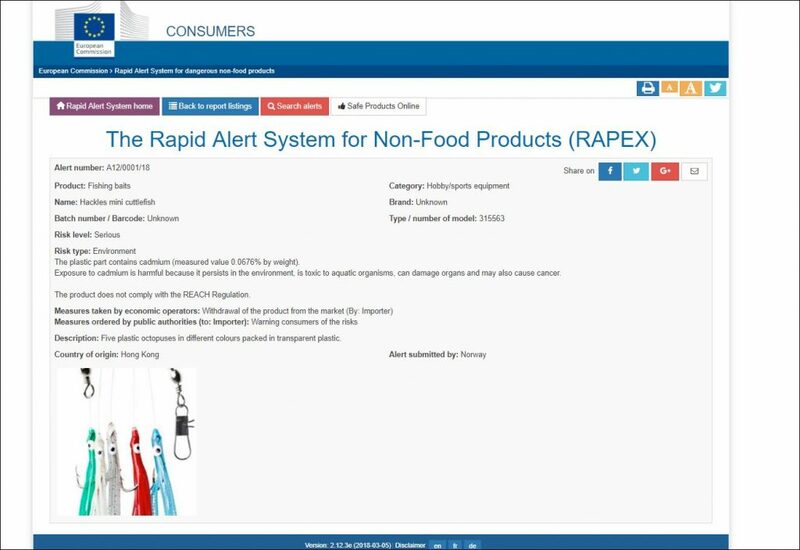 This system is called the Rapid Alert System, or RAPEX. This is not where you want your products to show up after a web search, see below. This site, published and continuously updated by the EU Commission, highlights and posts non-compliant products. These are products that were stopped in customs, started a fire, broke and proved unsafe, or were questioned and subsequently found to be non-compliant after further review. Below is an example of a product that was stopped in Germany and then submitted to RAPEX. The way to avoid this is by determining which EU laws apply to your equipment and then making sure that the product complies. 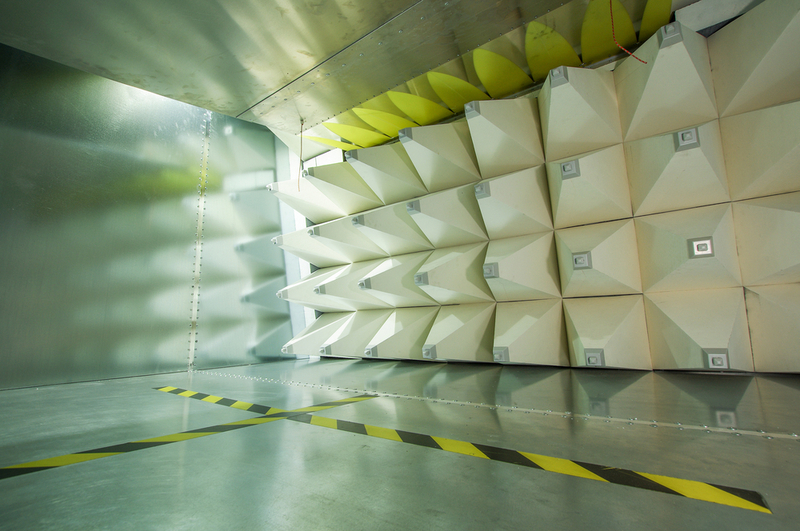 We are presented with a request for quote for IP69K testing on a regular basis at F2 Labs. Usually my first reply to the customer is this, “Do you mean IP69 or IP69K?” Believe it or not, there is a difference and it is an important distinction. This article will explain. Before we get into the details, the most general distinction is that IP69 testing is for equipment, like control panels or electrical equipment that is installed in areas that get washed (pharmaceutical manufacturing, industrial food packaging), and IP69K is for equipment installed on road vehicles. And the IP69K testing is meant to validate that the equipment installed in road vehicles can withstand very severe wash-downs with pressure washers. IP69 is the IP (ingress protection) code for a very high level of protection as indicated in IEC 60529 – Degrees of protection provided by enclosures (IP code). IP69K is the IP code for a very high level of protection as indicated in ISO 20653 – Road vehicles – Degress of protection (IP code) – Protection of electrical equipment against foreign objects, water and access. specified in the clauses indicated in the last column. Notice there is no reference to any “K” test or designation anywhere in the chart. It does not exist in IEC 60529. The IP69 testing consists of a dust test (IP6X) and a water test (IPX9). See this previous article for more information regarding IEC 60529 testing. As pertains this article, we want to investigate the differences between the IPX9 testing from IEC 60529 and the IPX9K testing from ISO 20653. 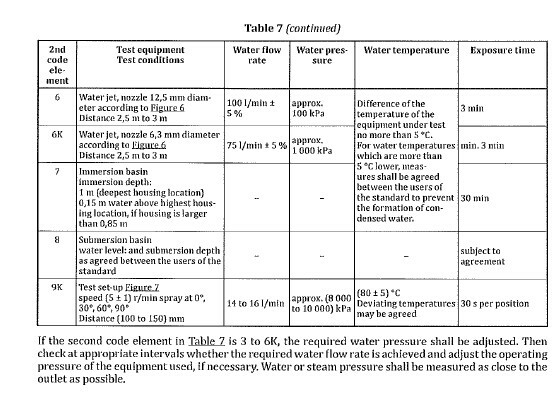 14.2.9 Test for second characteristic numeral 9 by high pressure and temperature water jetting The test is made by spraying the enclosure with a stream of water from a standard test nozzle as shown in Figures 7, 8 and 9. 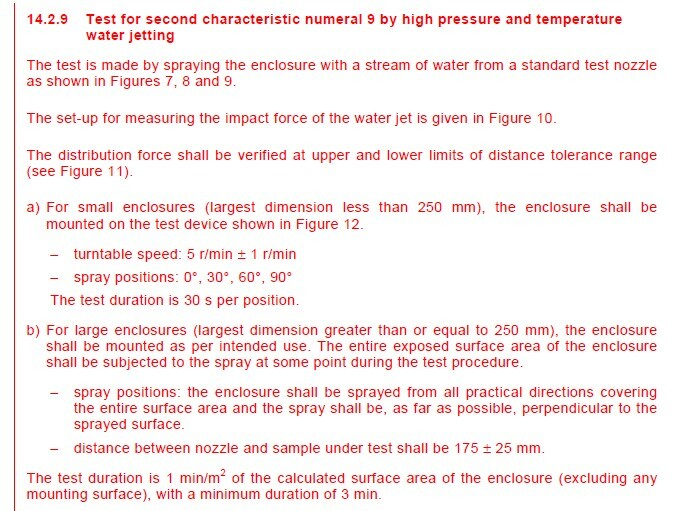 The set-up for measuring the impact force of the water jet is given in Figure 10. The distribution force shall be verified at upper and lower limits of distance tolerance range (see Figure 11). a) For small enclosures (largest dimension less than 250 mm), the enclosure shall be mounted on the test device shown in Figure 12. The test duration is 30 s per position. b) For large enclosures (largest dimension greater than or equal to 250 mm), the enclosure shall be mounted as per intended use. The entire exposed surface area of the enclosure shall be subjected to the spray at some point during the test procedure. – spray positions: the enclosure shall be sprayed from all practical directions covering the entire surface area and the spray shall be, as far as possible, perpendicular to the sprayed surface. – distance between nozzle and sample under test shall be 175 ± 25 mm. The test duration is 1 min/m2 of the calculated surface area of the enclosure (excluding any mounting surface), with a minimum duration of 3 min. 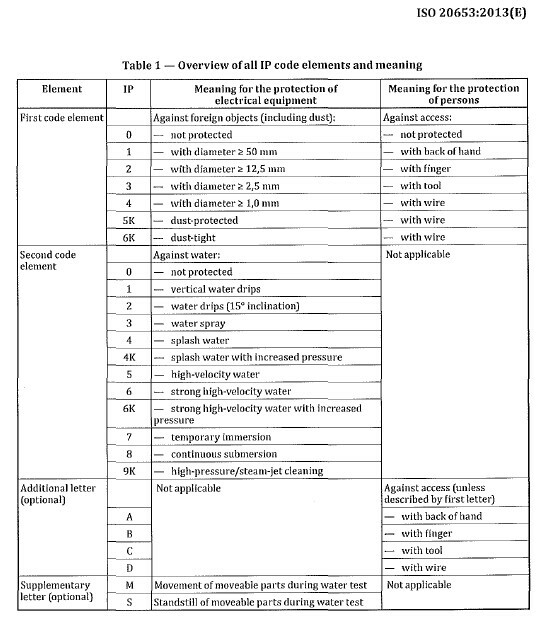 Table 1 contains an overview of the IP code elements. 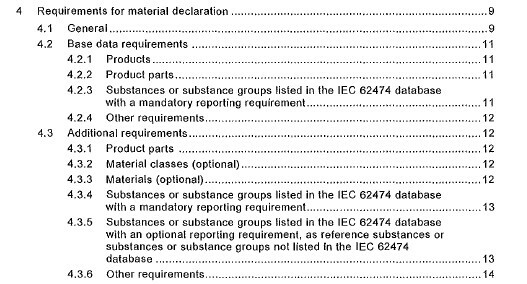 There are no “K” designations in the table from clause 4.2 of IEC 60529. Since most requests we receive with a “K” at F2 Labs are for IP69K, we will investigate the IPX9K test from ISO 20653 and compare it to the IPX9 test from clause 14.2.9 of IEC 60529. The distance for the test nozzle for the IPX9 test is 175 mm, plus or minus 25 mm and the ISO IPX9K test is 100 to 150 mm. The impact of the water is measured in terms of force for the IPX9 test while it is measured in terms of pressure for the IPX9K test. Adding to the confusion, there appears to be a typo in IEC 60529 standard that has caused some headaches (and probably not only here in our lab!). 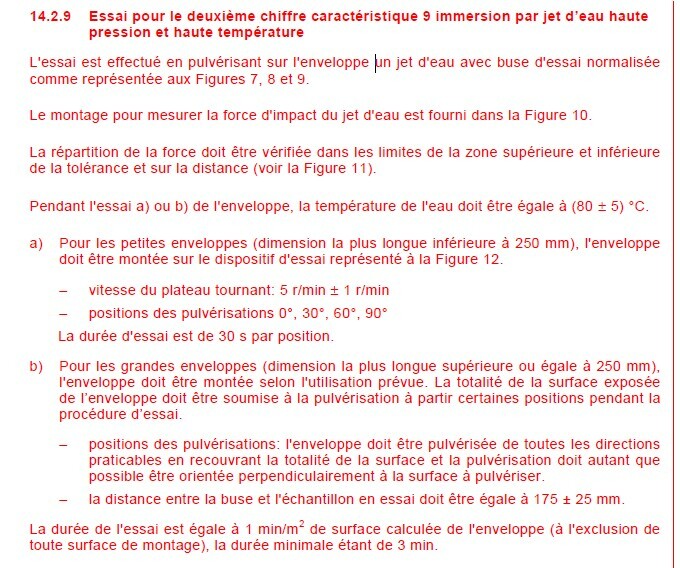 IEC 60529 was written in French and the standard, when purchased, typically comes in French and English in the same document. So, this validates that the temperature requirement is the same for IPX9 and IPX9K testing. Continuing, I have been asked on a few occasions to quote an IP69K test for a product based on the German standard, DIN 40050-9 – Road vehicles; degrees of protection (IP-code): protection against foreign objects; water and contact; electrical equipment. DIN is the German Institute for Standardization. IP69 is testing from an IEC standard and is for electrical equipment while IP69K is testing from an ISO standard and is for electrical equipment mounted on road vehicles. IP69 testing requires that the FORCE of a water jet is measured during the water test while IP69K testing requires that the PRESSURE of the water jet is measured during the water test. The distance of the water jet nozzle can be up to 50 mm further away for the IP69 water test (200 mm) as compared to the IP69K water test (max distance is 150 mm). Frequently DIN 40050-9 is indicated as a rationale for requiring IP69K testing. DIN 40050-9 is not an active standard. 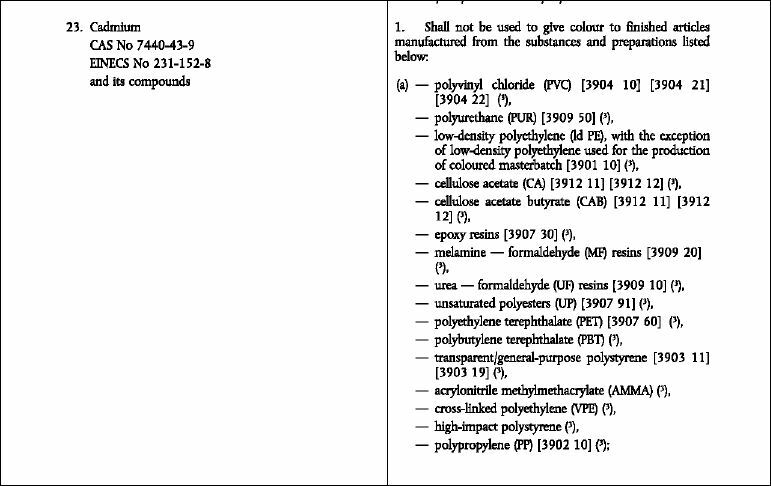 The Aerosol Dispensers Directive 75/324/EEC, also called the ADD 75/324/EEC is one of Europe’s oldest Directives. 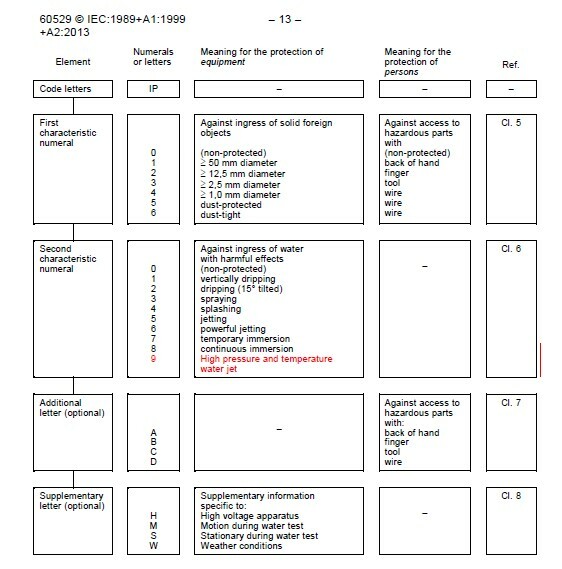 Although it has never been replaced like, for instance, the Low Voltage Directive 73/23/EEC (replaced by the LVD 2006/95/EC and then the LVD 2014/35/EU) it has been revised / amended many times. Fortunately, the EU publishes the amended version here, and you will not need to refer to the separate amendments. 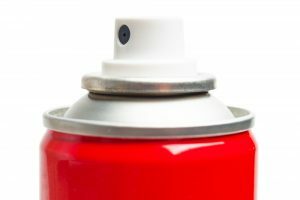 The ADD 75/324/EEC applies to aerosol dispensers as defined in Article 2 – any non-reusable glass, metal, or plastic container that contains gas under pressure with a release device so that the contents (liquid, powder, paste, or gas) can be ejected. One caveat is that the container, to be within the scope of the ADD 75/324/EEC, must have a maximum capacity of equal to or greater than 50 ml. That means the ADD 75/324/EEC does not apply if the container is 49.9 ml or less. 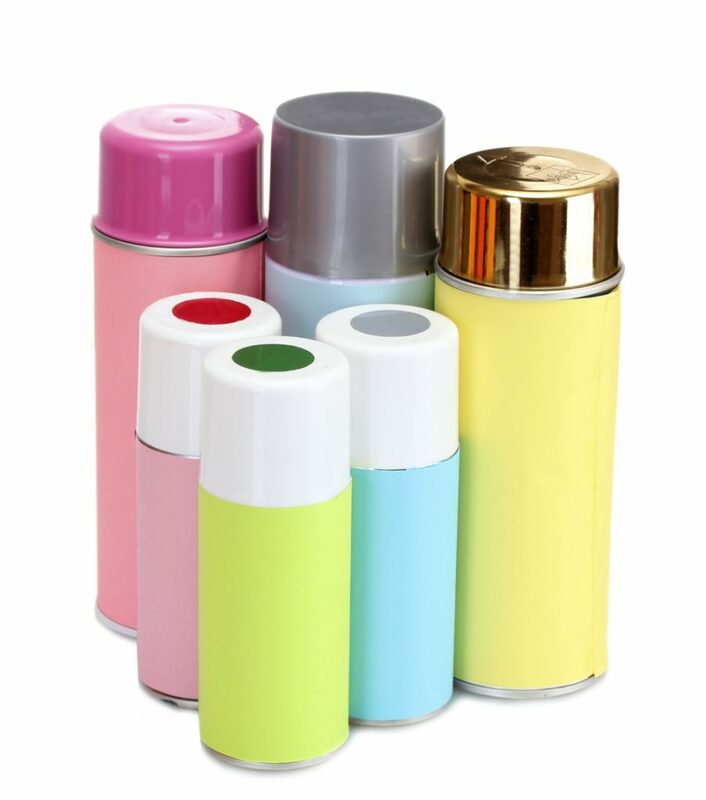 Aerosol dispensers which contain flammable mixtures must then be subjected to testing, as indicated in the Directive, to determine if it is flammable or extremely flammable. 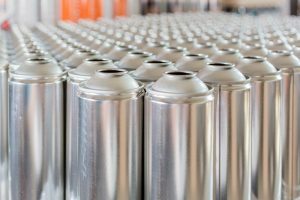 Flammable and extremely flammable aerosol dispensers are not barred from the market on that basis, they are subject to more extreme labeling requirements than non-flammable products. 6.1.4.1. 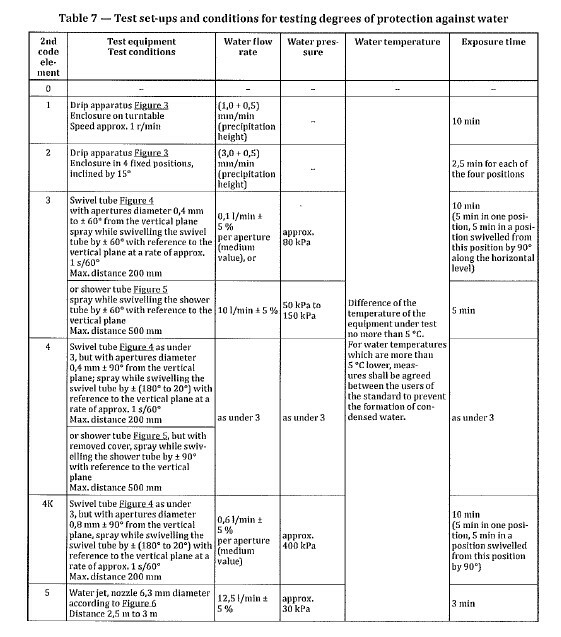 Aerosol dispensers shall be subject to one of the following final test methods. The test method must be approved by a competent authority. This can be problematic if the manufacturer, for whatever reason, cannot raise the temperature to 50°C. F2 Labs is here to help with your ADD 75/324/EEC project. Have a question or a comment? We can be contacted via this link. We can be reached by phone at 855-652-7281 and are here to help you. 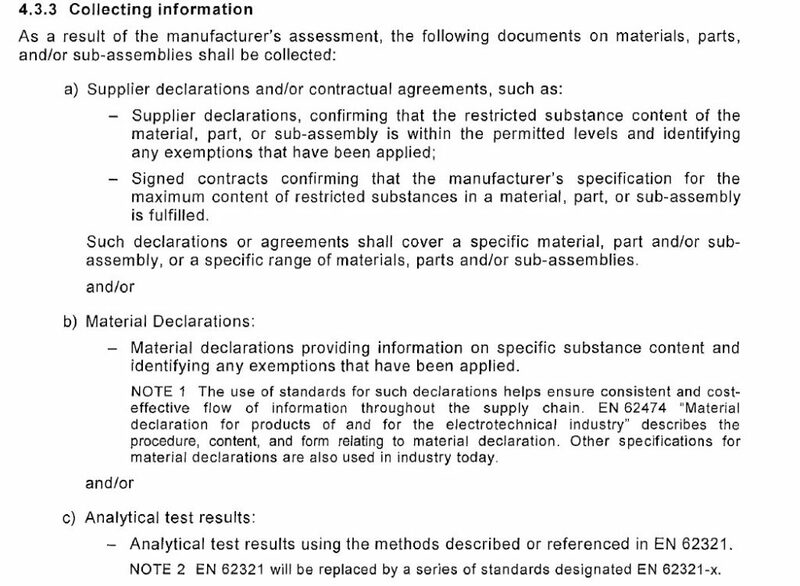 RoHS 2011/65/EU, EN 50581:2012, and clause 4.3.3. Manufacturers that send equipment to the EU with a CE marking must understand that a CE marking is a blanket claim by the manufacturer. The claim is that the equipment complies with any applicable CE marking Directive. This article is meant to explain the documentation required for the assembly of a report to back up that claim of compliance. Proving compliance to RoHS means compiling a report using the sole harmonized standard for RoHS compliance: EN 50581:2012 Technical documentation for the assessment of electrical and electronic products with respect to the restriction of hazardous substances. EN 50581:2012 details the process for collecting, evaluating, and organizing the information needed to prove that a product which is in the scope of RoHS 2011/65/EU is compliant. Manufacturers will need to collect supporting information for every component in the subject equipment, including labels, paint, glue… everything. Clause 4.3.3 indicates the information required, see below. 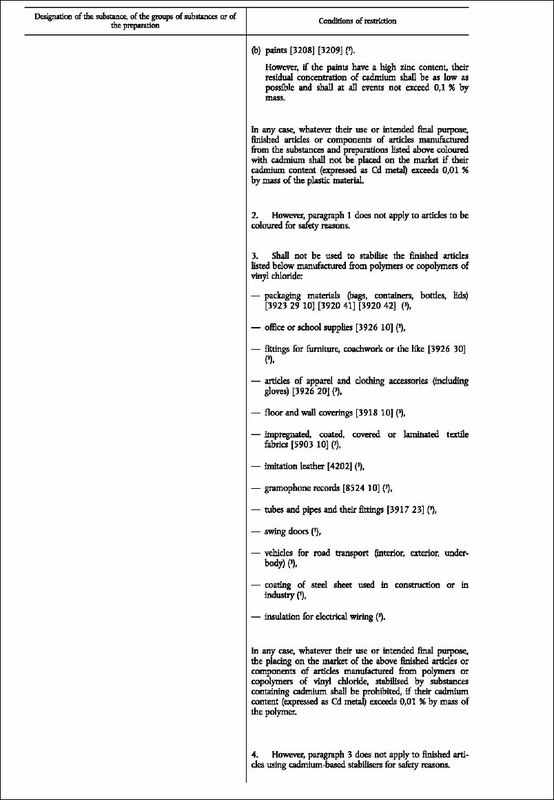 4.3.3 (a) indicates that a supplier declaration or a contractual agreement can be used. The first indent defines a ‘supplier declaration’. Simply put, this should be a document, on company letterhead, that identifies the part by part number and affirmatively claims compliance for that part to the RoHS 2011/65/EU restriction levels. It should be signed and dated as well. The second indent states that a contract can be used for this purpose as well. 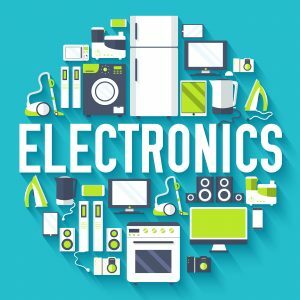 This could be a purchase order from the buyer (in this case, the manufacturer of the EEE that is in the scope of RoHS) stating that the parts must be compliant, and signed by the manufacturer of the part. The immediate takeaway from a comparison of EN 50581:20102, clause 4.3.3 (a) vs (b) is that a supplier declaration (or a properly formatted and signed purchase order) can be compiled more quickly and expediently than a material declaration. Next, clause 4.3.3 (c) from EN 50581:2012 is explained. 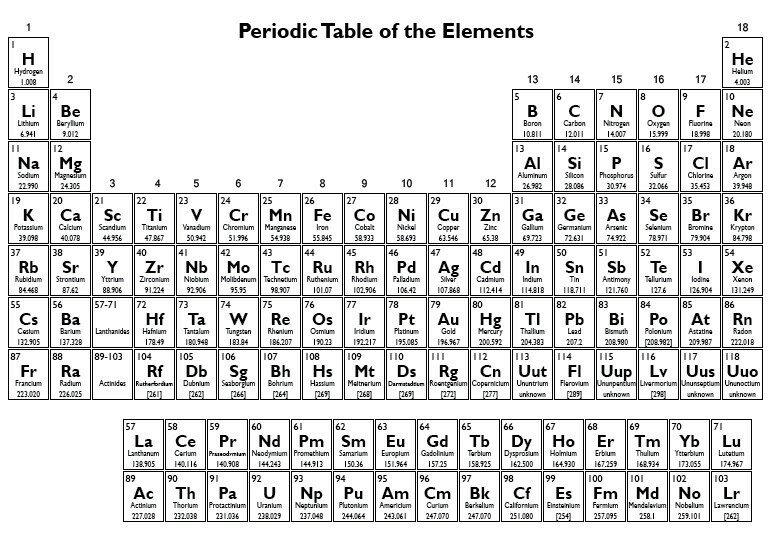 That section indicates that a manufacturer of a part can supply a test report, showing that the component was taken apart, chemically, in a laboratory and evaluated for its composition. These reports are common and, as a side-note, I have compiled EN 50581:2012 reports for F2 Labs customers based on laboratory reports for almost every component in the product. F2 Labs can help your company get a handle on RoHS 2011/65/EU and most other EU requirements. Have a question or a comment? We can be contacted via this link. We can be reached by phone at 855-652-7281 and are here to help you.